All rising 8th graders are required to read BOTH Bless Me Ultima by Rudolfo Anaya and Hotel on the Corner of Bitter and Sweet By Jamie Ford. Nick Otero, illustrator of How Hollyhocks Came to New Mexico, teams up again with New Mexico's beloved Rudolfo Anaya for a new children's book, How Chile Came to New Mexico, published by LPD Press. How Hollyhocks Came to New Mexico is a fanciful folk tale that helps explain the beautiful flowers that can be seen in all parts of New Mexico in the summer and fall. Escaping Herod’s wrath, Sueño, the angel, by mistake takes the Holy Family to New Mexico. How Chile came to New Mexico is the tale of the origins of chile, coming from the Native Peoples of Mexico. This long and dangerous journey explores unusual adventures. Acclaimed author and teacher Rudolfo Anaya blends history in these tales to show how different cultures can work together peacefully and respect our “enchanted” land. 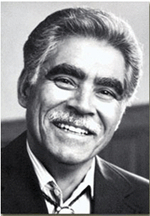 Rudolfo Anaya, the dean of New Mexico literature and author of Bless Me Ultima, has won many awards including the National Endowment for the Arts Medal of the Arts Lifetime Achievement Award for his writing. He is a native New Mexican and has written many books for adults and children of all ages. Nicolás Otero, an award-winning santero (a painter and carver of religious art in New Mexico), exhibits in Traditional Spanish Market in Santa Fe as well as the Heard Museum Spanish Market in Phoenix. He teaches elementary school art and lives in Los Lunas. Rudolfo Anaya discusses Bless Me, Ultima. Rudolfo A. Anaya , Bless Me, Ultima. Rudolfo Anaya returns to Bookworks! Our esteemed friend and author Rudolfo Anaya will return to Bookworks in July to sign two very special books! The first is his new book of stories from Oklahoma University Press, titled Rudolfo Anaya: The Essays ($24.95). We will also have the VERY LAST copies of the Farolitos of Christmas available for sale - this book has gone out-of-print and we have the last copies produced! Come get signed copies of both these great books and spend time with one of New Mexico's greatest authors. The first published collection of Rudolfo Anaya's essays "The storyteller's gift is my inheritance," writes Rudolfo Anaya in his essay "Shaman of Words." Although he is best known for Bless Me, Ultima and other novels, his writing also takes the form of nonfiction, and in these 52 essays he draws on both his heritage as a Mexican American and his gift for storytelling. Besides tackling issues such as censorship, racism, education, and sexual politics, Anaya explores the tragedies and triumphs of his own life. Collected here are Anaya's published essays. Despite his wide acclaim as the founder of Chicano literature, no previous volume has attempted to gather Anaya's nonfiction into one edition. A companion to The Man Who Could Fly and Other Stories, the collection of Anaya's short stories, The Essays is an essential anthology for followers of Anaya and those interested in Chicano literature. Rudolfo Anaya is currently considered a "single author." If one or more works are by a distinct, homonymous authors, go ahead and split the author. Rudolfo Anaya is composed of 6 names. You can examine and separate out names.